All World Scientific supplies winemakers nationwide with quality standard and specialty merchandise. 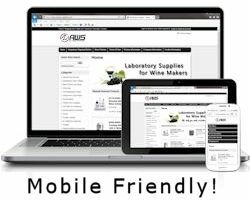 We provide the latest in equipment and supplies to to assure accuracy and efficiency in wine testing. We employ a helpful, knowledgeable sales department to make placing your orders easier. Terms: Net 30 days, after credit is established. Visa, MasterCard,American Express and Discover accepted. Shipping: All materials are shipped the most economical way possible in accordance with all carrier and D.O.T regulations. Prices normally include packaging, although occasionally special packaging charges may be added where required on hazardous materials. Express orders may be shipped by UPS (NEXT DAY, SECOND DAY, or THIRD DAY). Freight Claims: Upon arrival of shipment all packages should be inspected for damage or shortages. Do not accept damaged items until the carrier's driver makes a damage notation on your freight bill of loading. If damage is concealed, the carrier's inspector must be notified of the concealed damage and an inspection request must be made within 7 days of receipt. Under all circumstances retain damaged containers and packaging materials for inspection. Damaged shipments, and all claims for such, are the responsibility of the carrier. If a shortage is noted upon arrival of a shipment, have the carrier's driver make an appropriate notation on your freight bill or receipt, and file a claim with the carrier. If shortage is concealed and not noticed until a later date, notify All World Scientific Customer Service Department for assistance. Warranty: Warranty applies to equipment only for the warranty period stated in literature furnished with the products and applied only to the original purchases. Questions regarding repairs to products with expired warranties should be referred to our Customer Service Department. All warranted items are for repair or replacement, depending on the manufacturer's policy, credit will not be issued. If a problem develops with any materials purchased from All World Scientific please write, call or fax All World Scientific Customer Service Department for assistance in resolving the situation promptly. Returns: In order to obtain credit for returned materials or for a warranty repair, a Returned Goods Authorization (RGA) number must be issued by the Customer Service Department. Returns must be made within 30 days of receipt of RGA#. Returns are subject to a restocking fee and /or disposal charge, though application of these charges will depend upon the particular circumstances of the situation. Availability: We endeavor to keep most of the items listed in our online catalog in stock for immediate shipment from our warehouse in Monroe. However, we may experience occasional delays from manufacturers. Notice: The chemicals and solutions listed in our online catalog are offered for laboratory or manufacturing use only. We believe that the information and data included in our online catalog are true and accurate at the time of publication. Any recommendations or suggestions are made without warranty or guarantee of any kind. Consequently, we can assume no responsibility connected with the use of any products or the information included herein. All World Scientific shall not be responsible for any incidental or consequential damages whatsoever. Returns which will not be accepted include: Containers which have been opened, products which have exceeded expiration dates, or products requiring refrigeration which have deteriorated for lack of refrigeration.